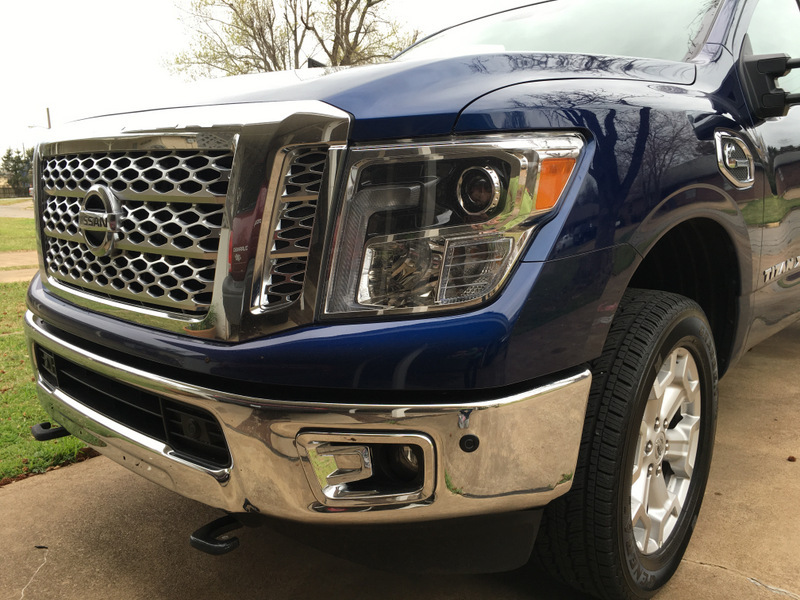 The perfect truck: the 2016 Nissan Titan. 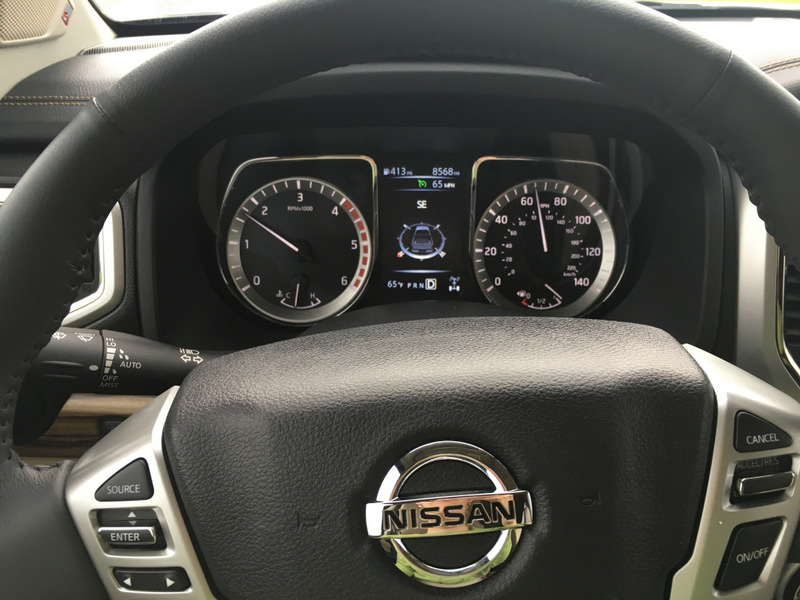 I missed the 2015 Texas Truck Rodeo and being surprised by the 2016 Nissan Titan. Everyone I know has been gushing about this truck since October and I’ve been itching to try it out. Nissan treated me to a week in the TITAN and my adventure began! 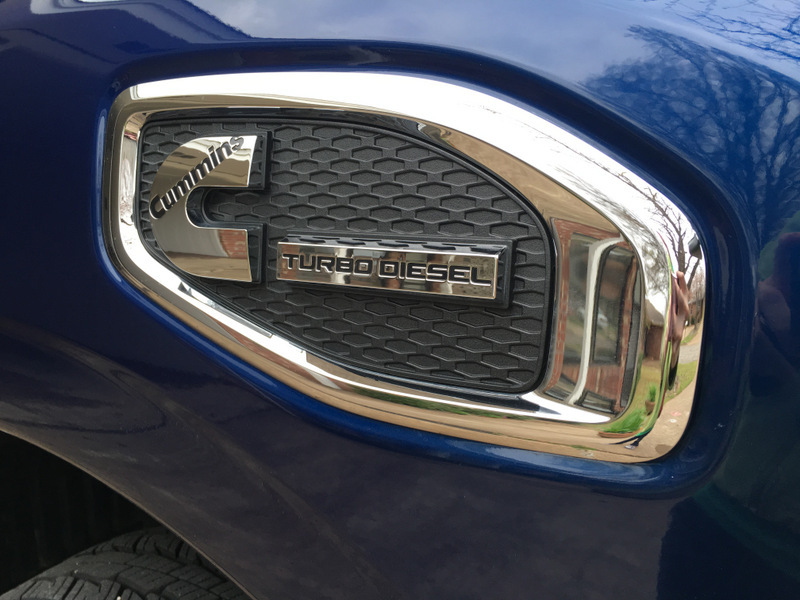 After a week in this truck, I’m not at all shocked that it won the Texas Auto Writers Association’s prestigious Texas Truck of the Year award. Everywhere I went guys asked “It has a Cummins? 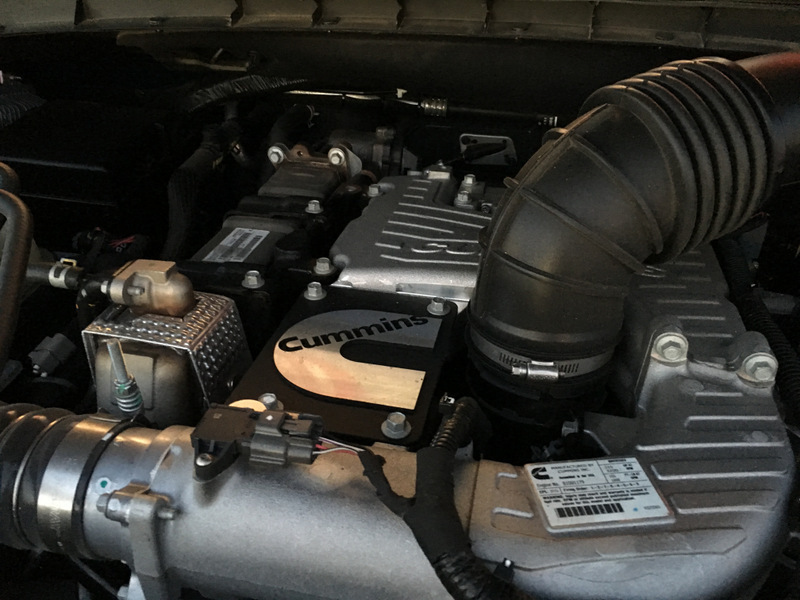 What’s the horsepower and torque on that thing?” Before long I knew more about the Titan’s Cummins 5.0-liter V8 Turbo Diesel engine that I’ve cared to know about any other engine, because everyone wanted the stats on this beast! Personally, I was less impressed with the stats and more excited by the fantastic rumble it created every time I accelerated. 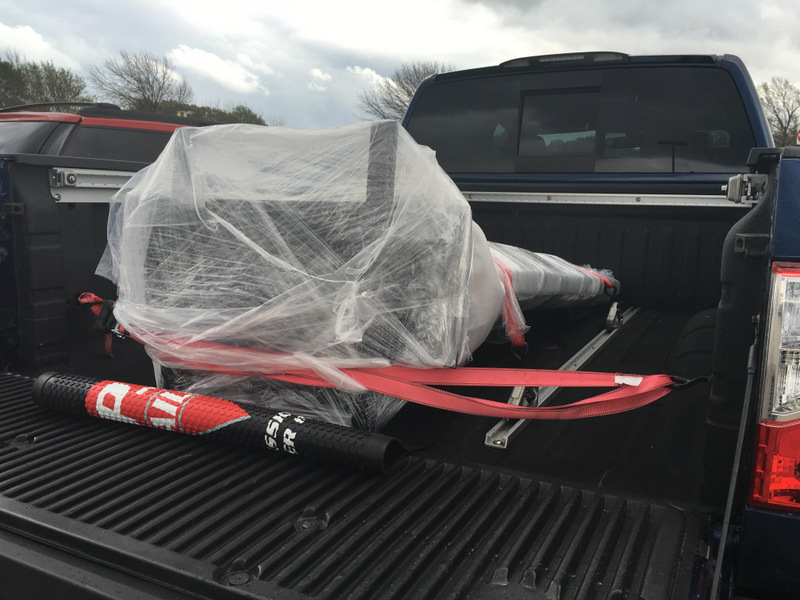 During our week with the 2016 Nissan TITAN XD my husband and I drove it to Houston (6 hour there and back) to deliver a 6′ tall, solid steel, kiosk to a trailer dealership. 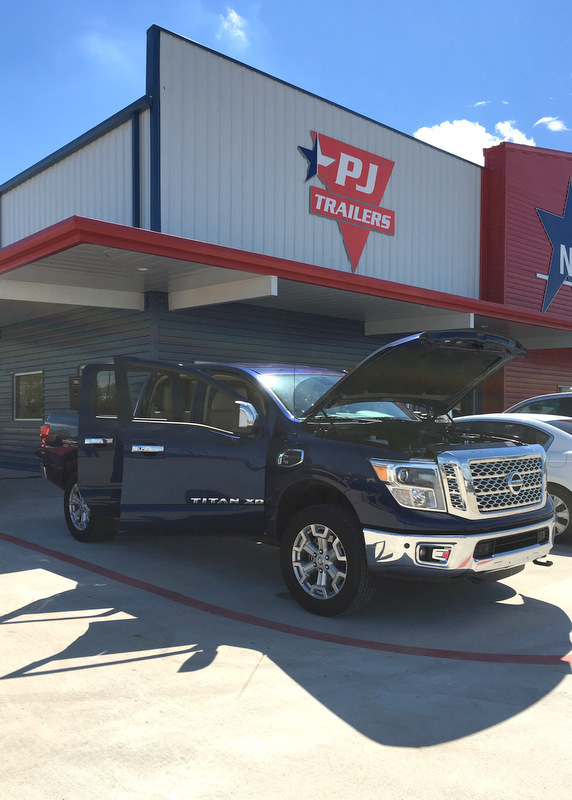 The dealership owners were so impressed with the TITAN they wanted it parked in a prominent spot out front, opened up for all their customers to see on the day of their grand opening. All day people walked around it, poked their heads inside, or checked under the hood. The Nissan Titan XD is a real looker. I’ve seen this truck in man colors, but the Deep Blue Pearl is my favorite. The squarish body style and commanding grill is very strong and masculine. Square shoulders, blue eyes… where’s that little emoticon with the hearts for eyes when you need it? Y’all know I don’t own a truck, right? This means that we tend to use my SUV like a truck and it’s taken a real beating. However, there are some things that just don’t fit in the back. A sheet of plywood? 12′ long 2″x8″ Nope. Since we had the TITAN for a week, we decided to go get all the supplies we needed to construct a jungle gym for our growing boys! Having the box bedliner kept me from worrying about messing up this pretty truck while hauling lumber and concrete blocks. When we delivered the kiosk we got to try out the Utilitrack C-channel with cleats built right into the bed. We used the cleats and some ratchet straps to secure the kiosk and my husband and I were both impressed with the system and how easy it was to use. The built-in gooseneck and 5th wheel abilities were pretty sweet too. The bed is flat because the gooseneck hitch is flipped over and stored in the bed until needed. This was a big deal to the guys at the trailer dealership. They loved this feature! Usually I’m not a fan of light interiors when it comes to a practical vehicle like a pickup truck. The model we drove had the SL Beige Leather interior, paired with black carpet and dash and some woodgrain trim. Nissan paired these colors well so the light areas were easy to clean, and all the places that would see the most wear and dirt were dark. The wood grain works perfectly to pull the two main colors together. Nothing test the comfort level of a vehicle like a road trip! After spending six hours in the truck, two days in a row, we didn’t have a single complaint. 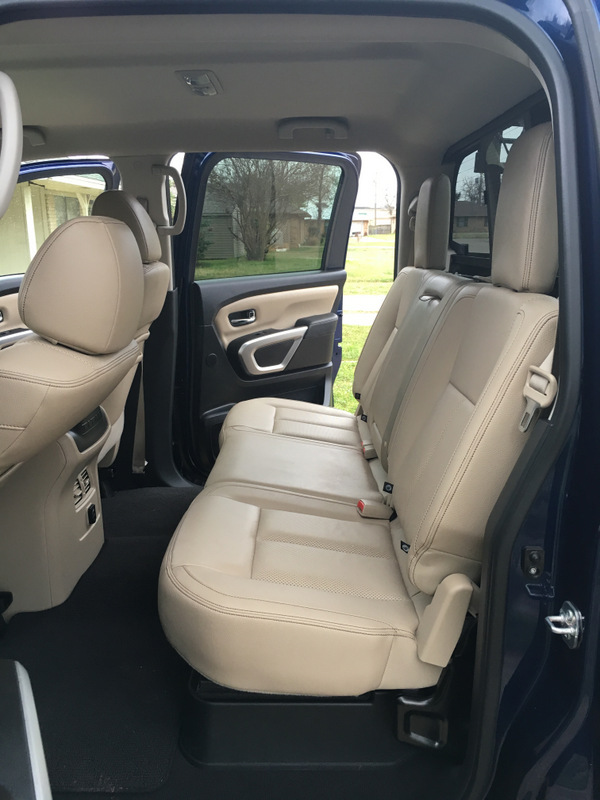 The cabin is spacious and even with the front seats all the way back there is plenty of space in the back seat for three adults. As you might have guessed from the mention of the built-in gooseneck and fifth-wheel abilities, everything you need for trailering is included. Trailer break controller, lights, hill start assist, and more. I grew up trailering horses from one show to the next and boy would these things have come in handy! 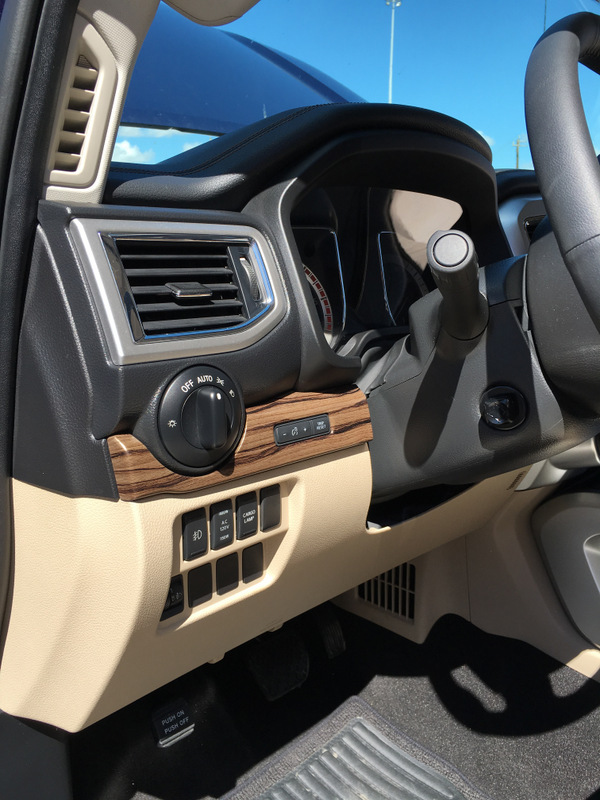 I’m a big fan of technology in every vehicle, but sometimes truck companies over do it and you feel like you’re in a luxury vehicle instead of a truck. Nissan’s engineers did a great job of pairing the latest tech with practicality. Hands-free calling, texting, and controlling of the navigation is all included and paired with a great seven inch touch screen display. 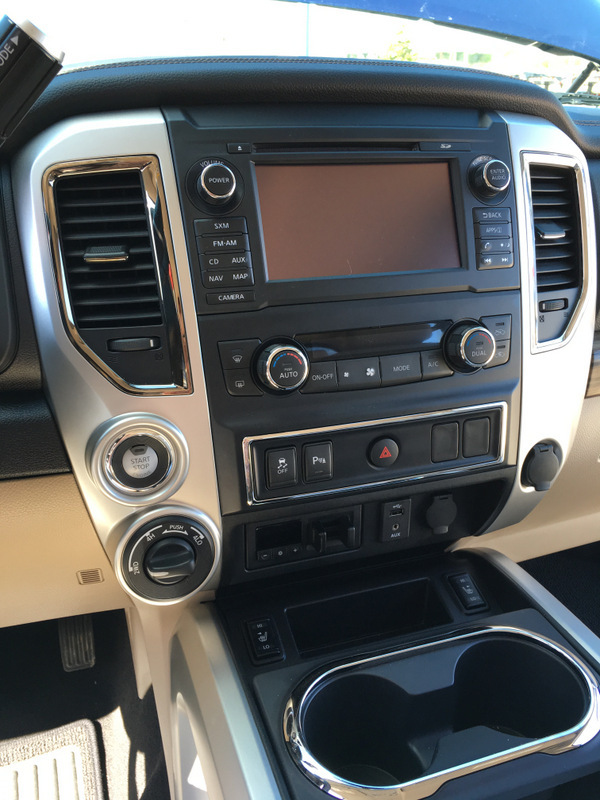 We found the controls for entertainment and climate to be very intuitive, making our week with this truck enjoyable! 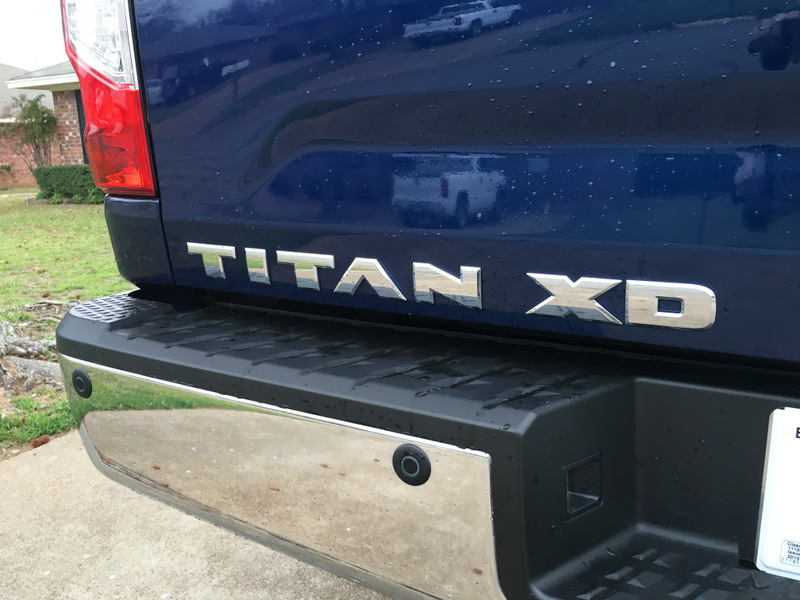 So What Did We Decide About the Nissan TITAN XD? 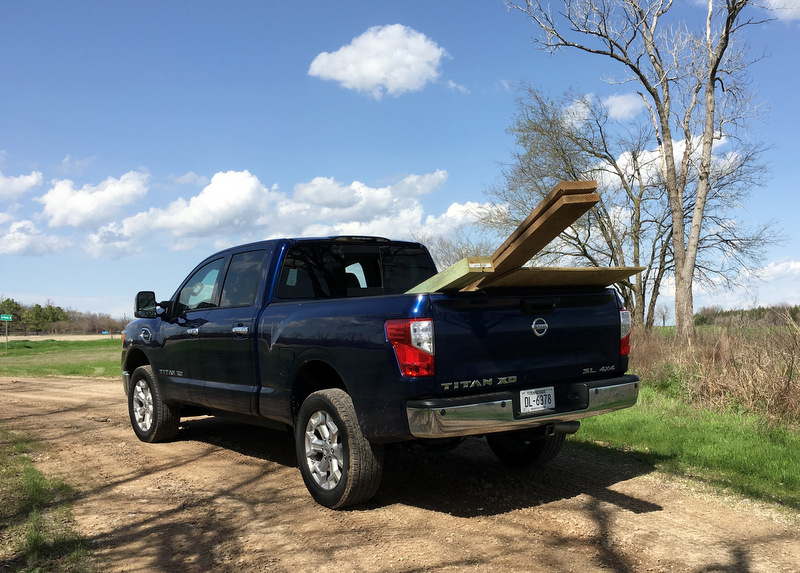 We were blown away by the 2016 Nissan TITAN. It has been added to our short list of trucks to consider purchasing. Our only dislike was the gear shift, which seemed a bit flimsy and felt really out of place with the rest of the truck. I’m not sure, but this could have been because the model we drove was a prototype. I’d been warned that certain aspects may be different in the production vehicle. I look forward to seeing that improved in future models. Honestly though, that the only thing we could find to complain about. This truck is so well engineered and styled that I’d call it the perfect truck.